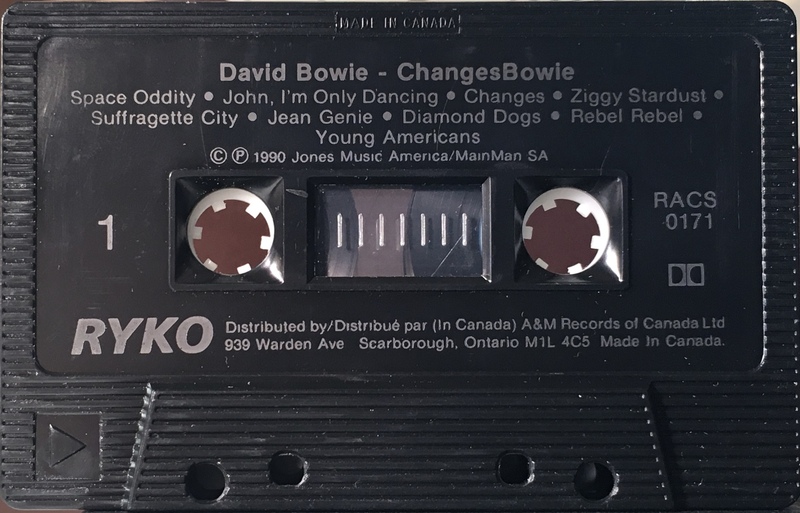 The ultimate site for Collectors & fans of David Bowie Cassettes ! 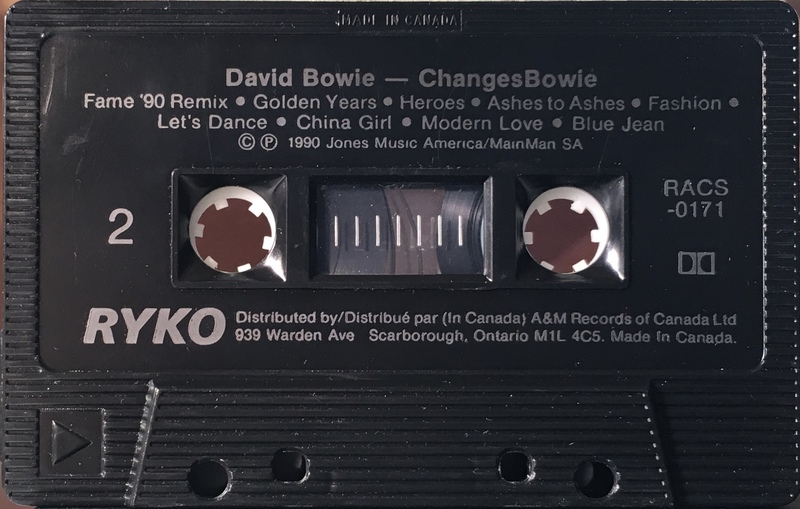 Changesbowie: Canada; RYKO, RACS 0171-2; 1990. Four panel cover on glossy, paper with cover photo over two panels; inner picture panels; light blue spine and deep blue rear panel. The inside and inner panels are a pictures collage. The rear of the cover has band, track and production information. Track list on rear and inner panels. BASF CrO2 tape and barcode on rear panel. Elliptical holes in rear panel. The same shorter track list as the USA release. Typical of Canada RYKO issues the inner panel is narrower than the rest. Silver ink printed directly onto black shell stamped ‘Made In Canada’; information in French and English. The track sequence is the same as the original LP. 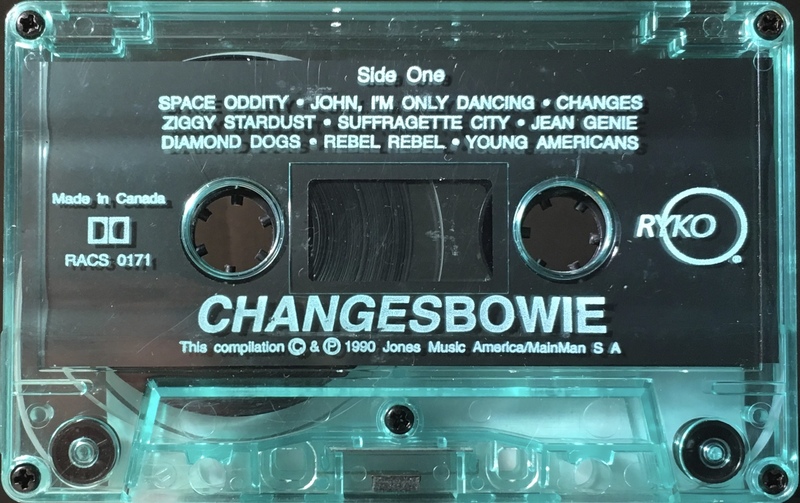 Side 1: Space Oddity; John I’m Only Dancing; Changes; Ziggy Stardust; Suffragette City; Jean Genie; Diamond Dogs; Rebel Rebel; Young Americans. 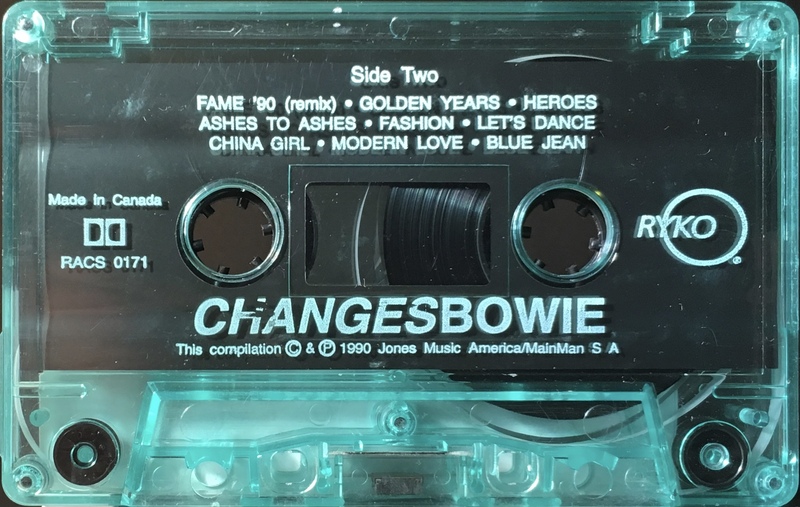 Side 2: Fame ’90 (remix); Golden Years; Heroes; Ashes To Ashes; Fashion; Let’s Dance; China Girls; Modern Love; Blue Jean. Four panel cover on glossy, paper with cover photo over two panels; inner picture panels; light blue spine and blue rear panel. The inside and inner panels are a pictures collage. The rear of the cover has band, track and production information. Track list on rear and inner panels. CDQ (Compact Disc Quality) and barcode. Round holes in rear panel. A shorter album than other issues. Typical of USA RYKO issues the inner panel is narrower than the rest. The USA cover has been used but ‘Manufactured in the USA’ has been omitted from the rear panel. White ink printed directly to clear green shell; plain slip sheet.